I like to support struggling actors/creative types. The above picture and video are from “Frozen – A Musical featuring Disney Princesses.” I don't know very much about it, but I stumbled upon it and it seems colorful and tuneful and features the princesses, so here it is. The video is from two brothers who call themselves "AVByte." They did “Sherlock the Musical.” It appears to be an original stage musical in which the "Frozen" sisters rescue the other princesses (pictured, Snow White, Aurora, Cinderella, Ariel the Little Mermaid, Jasmine and so on). The theme (repeated endlessly in the song in the video) appears to be "I don't need a man." So ladies, if you were confused on that point - watch the video. It's tuneful and colorful, so may be worth a look regardless. My congratulation to the costume people, who did a fine job on what looks like a threadbare budget. I don't really know much more about it. If you simply love it and need to learn more, you can follow AVByte on Twitter under @AV_byte. 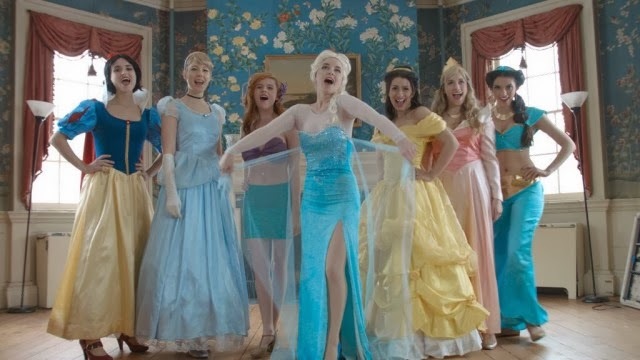 The musical stars: Michelle Cameron (Queen Elsa), Elizabeth Oldak (Belle), Tanja Nagler (Cinderella), Molly Gallagher (Ariel), Tiger Darrow (Snow White), Dominique Roberts (Aurora) and Celeste Hudson (Jasmine). Music and Lyrics by Antonius Nazareth. Directed and Edited by Vijay Nazareth. Costumes by Elizabeth Oldak and Martin Lara.